Last time in our series on the making of an album, we discussed the choice of a location to record. Whether you choose a studio or go mobile, the preparation is pretty much the same. However, the engineer should organise any extra equipment that needs to be rented should you go mobile. Before you set foot in the studio, though, you should have a look at the condition of your instruments. The majority of bands are made up of guitarists, bassist, drummer and maybe a keyboard player. Take your guitars and basses to be serviced by a professional; don't do it yourself unless you are supremely confident! The last thing you need is to be in the middle of a session and you discover your intonation is out. Also, if your amps are buzzing get them sorted out too. The less time spent fixing problems during the sessions, the better. Buy a decent tuner too and make sure it's used to tune everything. When it comes to the drums, get new skins and make sure that they're well stretched. Don't bother taking too long to tune them as you will probably have to re-tune them in the studio. Some kits are also prone to rattling and squeaking. Strip them down and make sure you tighten all that needs tightening and oil all that is squeaking. Keyboards and samplers are pretty straightforward. If they work then great. If they don't then get them repaired. Any other instruments you might have, like mandolins, violins, cellos and bagpipes, should be looked at too! One other piece of prep work is to get your drummer used to a click track. I know that those two words can be more offensive to a drummer than if you were to question his parentage but if a drummer is well used to one then your recordings will sound much more consistent. Also, a click track makes previously unrepairable mistakes repairable and allows for loops and samples to be easily flown into the songs. Be aware too that click tracks don't have to be blips and ticks; they can be percussion loops, drum loops or even a manually recorded shaker or tambourine. We now have all our prep work done, hopefully, so next up is what happens in the studio. Get there early; for mobile work there will be a lot of setting up to do. The engineer should have chosen an area for each musician, so set up there and make it comfortable. One idea that has served well on many an album is to buy a large artist’s pad and write down the name of each song on a separate page. As you start recording you can tick off what needs to be done. This not only shows what is left to do but also, if you are in the middle of a particularly difficult take, you can glance over and see what you have already achieved. There are a few different ways to set up for the initial recording. A preferred way is to separate all the noise sources as much as possible. An example would be to drag the amps out into different rooms. Once that is done you can play together as a band and any mistakes can be later repaired easily. If, however, you have an amp in the same room as the drum kit and the guitarist hits a howler then the drum mics will pick that up and the whole take is ruined! All the musicians will still be in the same room wearing headphones and maintaining line of sight but the only audible noise is the drum kit. Some more experienced bands set up everything in one room. As mentioned earlier, this could sound great but one mistake ruins an entire take. Another option is to pre-record vocal and guitar "guides" to a click track. The drums and bass can then record take after take while the rest of the band can take a breather and listen to the takes. This can work out well but having the whole band in the one place can create a kind of energy that might not be easily replicated in this way. You'll find that as the session progresses all of the above options might eventually be used along with some others. Now you're well in to the recording process, doing take after take and making sure to tune in between each one. Make sure you don't overdo it too soon. The excitement of the recording, coupled with the goal of perfection, means that it's all too easy to burn out too soon. Take regular breaks, get some air and go for walks. You have 10 or so songs that have to be given the same attention and passion. Please be aware too that the engineer needs a break; it's easy to forget that the one person who can't take a break unless the entire band do is the engineer! Also, if you work for 15 hours a day for 3 straight days you will get tired and the later recordings might not be up to scratch. If they have to be re-recorded then you will end up spending far more time and money on the album than is needed. Once the recording is finished for the day, relax and have a drink or two. Don't drink or "smoke" during the recording if you can help it. You're there to work, not to get langered. 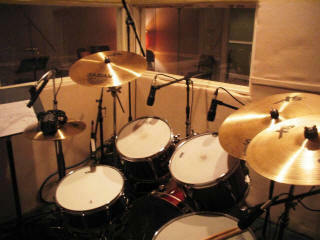 Once the basic drum, bass and rhythm tracks are done, the next step is the overdubbing stage. As mentioned last time, it might be an idea while mobile to set up a dead room for the vocals, but you don't necessarily need a large studio to do this. Indeed, there are many project studios that can meet your needs for a fraction of the price of a studio or going mobile. When you are overdubbing as before make sure you take your time, and if you get stuck on trying to get a certain take then move on and come back to it later. Nothing is more annoying than spending 2 hours trying to get a guitar lick right. You may laugh, but a lot of bands can do the hard stuff really well and get stuck on the simple things. So, we have all of the recording finished and it all sounds great. Next up is the editing and mixing stage. We'll get on to that in the next part of this series. Check out as well the archive of newsletters we have sent out over the years. © 1999-2010 www.CLUAS.com & individual writers as indicated per byline.